Category Archives: Wren House Brewing Co.
3 - Indifferent (buy if no other choice), American Triple IPA, Beer Reviews, USA, Wren House Brewing Co.
Brewery: Wren House Brewing Co. 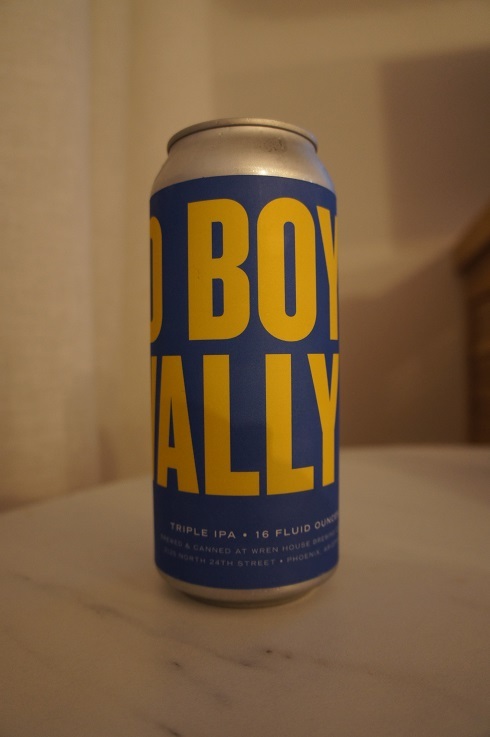 Brewer Description: (from facebook can release page) Sad Boy Wally is our latest installment in the Wally Triple IPA series. Brewed with American pale malt, malted white wheat, and boiled alongside Arizona wildflower honey. Hopped and dry hopped with the most citrus forward hops we could get our hands on! Featuring Citra, Amarillo, Cascade Lupulin Pellets, and Columbus. We got a little crazy with this one and topped our previous hop usage record with a massive 9lb/bbl hopping rate. In order to highlight these huge citrus flavors we kept the abv in check at 10.5%. We’re picking up huge aromas of candied orange/grapefruit, a total citrus bomb!! Mouthfeel is super thick with almost no perceived bitterness. Absolutely our favorite Triple IPA to date! Intro: A 1 pint can, canned on 15th March 2018. Poured into a MBCC 2018 stemmed tasting glass. Appearance: It was a cloudy mango juice orange with a half finger white head that dissipated fairly quickly, but left some thin but nice lacing. Aroma: Orange juice, grapefruit, mango and light candied citrus. Taste: Tangy, bittersweet, citrus, orange rind, grapefruit peel, pine and pineapple with only a hint of bitterness. Mouthfeel: Full bodied with moderate carbonation. Overall: This was pretty good, but perhaps too purely citrusy for me to fully appreciate.